Earlier this week, I had the privilege of attending Elliott Masie’s Learning 2013 conference in Orlando, Florida. Like a child waiting for Santa, I had been eagerly anticipating this trip for months. The Masie Center has a reputation for quality events with a bit of a dramatic flair, and Learning 2013 did not disappoint. My conference experience began with a bang, as the first session I attended on Monday morning immediately became one of my favorites. Jayzen Patria and the team from NBCUniversal’s Talent Lab shared experiences from their recent rebranding process and how it helped engage their learners. This company walks the walk when it comes to engagement. Corinne Schuler kicked off the workshop by having each us identify brands we admired and three adjectives to describe them, which we then posted to Twitter for prizes. Not surprisingly Apple, Starbucks and Disney were popular choices of brands to emulate. Daniel Zumbrunnen then walked us through how NBC’s Talent Lab had used this same exercise to determine how they wanted their learners to perceive the program. Think about the adjectives you want (and don’t want) to come to mind when others interact with your brand. When designing a new training initiative, make sure you’re listening for those words in user feedback and rethink your approach if you hear the adjectives you don’t want identified with your brand. Another favorite session was presented by Gordon Trujillo and Samir Desai of Accenture on personalized learning. Accenture noticed many employee’s first instinct when needing to acquire a skill quickly was to search YouTube or other external sites. In an effort to tie in this behavior with existing internal resources, Accenture built a custom interface to crowdsource curriculum tracks, which they call “learning boards.” Curators build learning boards by collecting content from both internal and external resources. Learners can then “follow” the boards to begin taking the courses—Pinterest meets elearning. While this approach provides Accenture employees with more flexibility and encourages the most popular courses to rise to the top, it isn’t for everyone. For one, many companies won’t have the resources available to custom build such an interface. On the other hand, this innovative design certainly illustrates where the market is headed as more companies seek flexible, personalized and scalable learning. While there were a wide variety of sessions and speakers, many topics circled around three key themes. Some of these were overt themes, such as concerns and best practices around learning management systems. Others were more subtle and arose more from informal discussions outside of the conference sessions. A major topic for many of the sessions, it is clear companies are looking for a shake-up in the LMS market. Many attendees expressed frustration at the lack of features or lengthy set-up time of their current providers. In fact, all four panelists at one session I attended were in the process of, or considering, switching LMS providers. Despite these challenges, the message of the conference was not to ditch learning management systems entirely. Companies clearly have a need for the metrics provided by their LMS, as evidenced by the number of big data sessions. To continue to stay relevant, LMS suppliers will need to educate users on how best to analyze this data and apply the results to maximize their online training programs. Additionally, learning management systems will need to find their place in the world of personalized learning—whether that means integrating with alternative systems or adding features to encourage more collaboration between learners. As a vendor, attending Learning 2013 provided our team with a rare opportunity to interact with current and potential customers in the flesh. We appreciated the opportunity to listen to current frustrations and took away many key lessons in the process. It is very clear learning departments are being asked to meet more demand with fewer resources. Many attendees shared stories of recent cutbacks on their staff, yet at the same time receiving requests from management to generate more content or expand training. These demands on learning professionals really hit home for us, as our goal is to ease the burden on training departments. While many of our programs, such as our Pay-Per-Use option, already exist to help reduce elearning waste, the conversations from Learning 2013 tell us there is still more we can do to meet those just-in-time training needs. Many words were used to express this sentiment throughout the conference—engaging, interactive, purposeful. Regardless of the semantics, learning officers are very interested in making training more meaningful through the use of stories. Several sessions focused on this idea, most notably George Takei’s interview with Elliott Masie. As a social media powerhouse, George Takei has built his brand around telling great stories. He expressed the importance of storytelling in not only passing along history, as in the case with his internment experience during WWII, but also to pass along learning. This resonated with many of the attendees, who are looking to create more personalized learning experiences through the use of scenarios and stories. Does this signal the end of PowerPoint trainings as we know it? One thing’s for sure…we’ll be seeing some interesting shifts in instructional design in the near future. 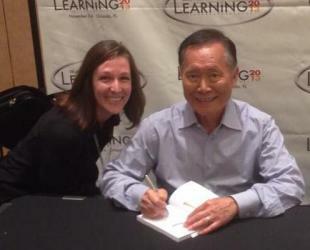 With keynotes from the likes of Hillary Clinton, George Takei and Jane Pauley, as well as intermittent performances by Broadway stars, Learning 2013 was an engaging and energizing experience. I’m so proud to have represented as a sponsor for such a quality event and will be very busy over the next few months implementing the ideas inspired by my attendance. Also be sure to check out this list of resources from the conference backchannel, curated by David Kelly.